Banana is one of tropical fruits liked by many people in the world. The fruit contains many health benefits, along with high energy content which is often added in athlete’s diet. But not many people know that the banana leaves also have many health benefits. Banana leaves (dried one and fresh one) can be used as herbal too. They have many benefits for our health and beauty, and can cure ailments such as sore throat, cough, common cold, and fever. It is also used as traditional spa ingredients in Bali, which is very good for the skin. n South-east Asia, banana leaves are often used as garnish to enhance the appearance of foods and as food wrapping. So far, most people only know banana leaves as food wrapper or as a material for handicrafts. 1. Boosts Immune System - Dried banana leaves contains allantoin, a substance known to boost immune system, accelerates healing process and acts as an astringent. This is why banana leaves can cure sore throat and fever, which are mainly caused by poor immune. Even if we do not have such ailments, we also can drink banana leaves decoction or tea atleast once a day to boost our immune system, so we cannot contract the ailments easily. 2. High in Antioxidants - Banana leaves are high in polyphenols, a type of antioxidants. Antioxidants is needed to fight many disorders caused by free radicals in our body. It fights free radicals, thus preventing micro-inflammations caused by free radicals. Those micro-inflammation can cause many degenerative diseases, such as atherosclerosis, alzheimer, dementia, even cancers. High anti-oxidants is also known to prevent early aging signs such as wrinkled and dull skin. To get this benefits, we can drink banana leaves tea 1-3 times a day. 3. Heals Wounds and Skin Irritation - Fresh banana leaves are used traditionally to cure wounds and irritation. Just crush some banana leaves by a mortar, then put it on the affected area. We can bind it with bandage to prevent it falling away. Change the leaves and bandage 2-3 times a day. 4.Cures Sore Throat - Sore throat is a symptom of many respiratory-related illnesses, and mostly caused by virus, so antibiotics may not help at all. Sore throat is really annoying, making us feel painful when swallowing foods or beverages. Drinking banana leaves decoction atleast once a day can reduce the sore throat gradually. 5. Treatment of Dysentery - Allantoin and polyphenols in dried banana leaves can reduce intestinal bleeding in dysentery. We can drink the decoction atleast once a day to stop the bleeding. The astringent effect also reduce the stomach pain due to hyperperistaltic activity of intestines. The good news, banana leaves do not interfere with prescribed drugs, so in severe dysentery we can take drugs and banana leaves tea/decoction together. 6. Reduces Fever - Antioxidants and astringent contained in banana leaves are good substances to reduce inflammations, which often take form in fever. The astringent effect will also sooth the unease feeling of fever. To reduce fever, we can drink the decoction 3 times a day. 7. Maintains Healthy Skin - One of the health benefits of banana leaves is to promote healthy skin. Banana leaves mask has been used in traditional spa for generations to maintain healthy skin. The fresh leaves are crushed with mortar or blender, then applied to the face or all over the body. The allantoin and antioxidants helps preventing early aging signs on the skin (such as wrinkles and dark spots), cures skin irritation, reduce acne and pimples, and keep the skin moist and soft. 8. Maintains Healthy Hair - Banana leaves extract can cure dandruffs, maintain healthy scalp, and keep the natural color of the hair, thanks to its high allantoin and astringent effect. If we often have itchy and sore scalp, this banana leaves hair mask is proven to be very effective. We can take some fresh banana leaves, then crush it with blender. Apply it as hair mask on the scalp and hair, let it sit for 10-15 minutes, then rinse it off with cool water. Using this hair mask regularly will also make our hair looks shiny and more beautiful. 9. Reduce Cellulites and Body Weight - Traditional spa also uses banana leaves as traditional weightloss program. There are 2 ways in using the banana leaves: first, the mashed fresh leaves are used as body mask to reduce the cellulites and keep the skin healthy. The second, the whole banana leaves are steamed and then wrapped on the desired area (usually belly, upper thighs and upper arms) for 1-2 hours. After the treatment finishes, a cup of tea made of banana leaves and ginger is taken. This treatment was popular in Sultan’s Palace in Yogyakarta and the Kings’ Palaces in Bali, to maintain the beauty of the queens, princesses and concubines. But now we can find this traditional treatment in many spa in Bali. However, the treatment will be more effective if we do low-calories diet and sports too. 10. Handicrafts - Many handicrafters use dried banana leaves for their products. Usually, dried banana leaves are woven and made into bags, belts, and bracelets. Dried banana leaves are seen as waste in tropical countries, but those handicrafters can transform them into beautiful artistic goods, which are highly priced. Some designers now are looking for these goods to make up their fashion ideas, as a program of reducing waste. 11. Livestocks’ Foods - Livestocks such as goats, sheep, cows, chickens, even rabbits like to eat banana leaves. They like the taste, especially the young leaves. 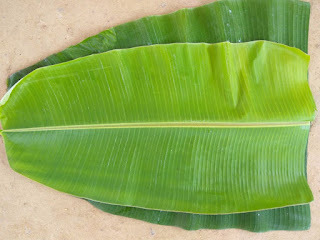 Banana leaves also contain good nutrition for them and act as their natural medicine. If we have livestocks or pets at home, we can feed them fresh banana leaves. It is cheap, and sometimes people just throw away the leaves after taking the fruits. The dried leaves can be stored and used like hay. Now, many animal food factories use powdered banana leaves as an ingredient of their products. 12. Food Wrappers - Traditional South-east Asian foods, such as Vietnamese, Thai and Indonesian foods often use banana leaves to wrap the cakes, chicken and fish. The banana leaves give particular pleasant aroma that can increase our appetite. Foods wrapped in green banana leaves also looks beautiful. 13.Headaches reliever - Young leaves used for cool dressing of inflamed and blistered surfaces and as cool application for headaches. 14. Hygienic - The Banana Leaf is a wrapper for food hygiene. To wrap food, better use banana leaves as compared to using a plastic wrap made with polymers that can cause cancer, especially when used to wrap the food that’s hot. 16.Prevent Hallucination - leaves put under the pillow at bedtime to prevent Hallucination. 17. . Enhancing Body Endurance - Banana leaves can enhance the immune system of a human body that are weak. In addition to enhancing endurance, a banana leaf can also ward off free radicals inducing cancer that are increasingly dangerous for human health. Perhaps this is a strange thing, but the substance that is stored in a banana leaf namely allantoin can be converted into an anti-oxidant producing agent. 18.Pre Hepatic Jaundice - infusion of leaves used for bathing in pre-hepatic jaundice. 19. Anti-Ulcer Activity - Study of dried powder of banana pulp showed anti-ulcerogenic activity, esp in the unripe, mature green plantain banana. 20. Wrapping or Cooking - Leaves used for wrapping food for cooking. Leaves used for polishing floors, lining pots for cooking rice. 21. As Neutralizing poisoning agent against venoms - Banana leaf benefits can also be used as a poison neutralizing agent against liquid that was injected into one’s body such as venom. 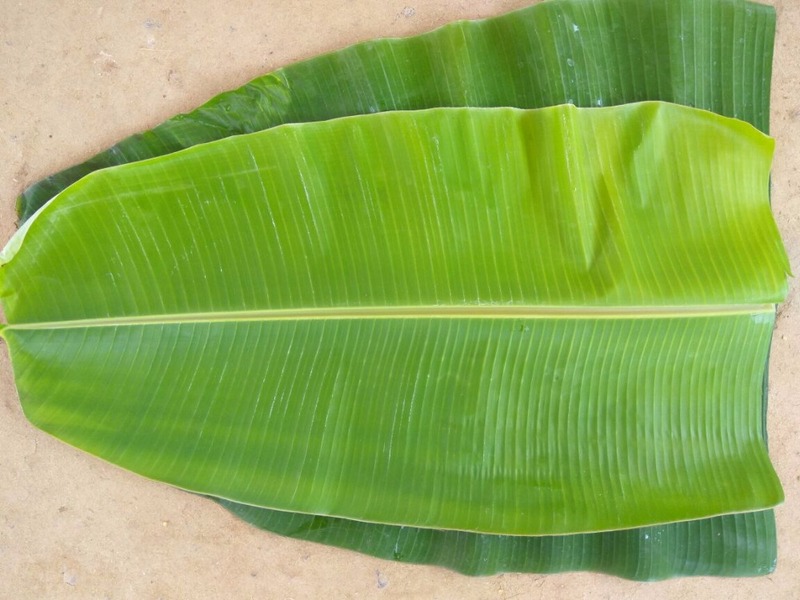 If you are attacked by insect bites such as ants or mosquitoes then you can use banana leaves to neutralize the toxins and it will have no side effects whatsoever. You just need to grind banana leaves until it turns into a powder, then applied to the affected area of insect bites accordingly.